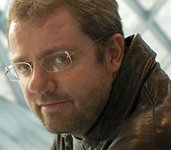 Matt Ruff writes a blend of urban fantasy, science fiction, and mainstream literature. Fool on the Hill was nominated for a Mythopoeic Award for Adult Fantasy Literature. Learn more at Matt Ruff’s website or the Bad Monkeys website. Jane Charlotte, the woman in question, says she works for a secret organization called, well, the organization. This organization has a unit called “The Division for the Final Disposal of Irredeemable Persons” — nicknamed Bad Monkeys. (All of the organization’s divisions have nicknames.) 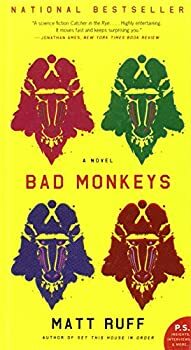 Jane, a Bad Monkeys operative, has been captured because one of her assignments went bad, but as she starts telling the doctor her story, it’s clear that things started going wrong in Jane’s life much earlier. Fool on the Hill — (1988) Publisher: A young writer-in-residence at Cornell University is caught up in an epic of love and death, good and evil… and magic. Sewer, Gas and Electric: The Public Works Trilogy — (1993) Publisher: High above Manhattan android and human steelworkers are constructing a new Tower of Babel for billionaire Harry Gant, as a monument to humanity’s power to dream. In the festering sewers below a darker game is afoot: a Wall Street takeover artist has been murdered, and Gant’s crusading ex-wife, Joan Fine, has been hired to find out why. The year is 2023, and Ayn Rand has been resurrected and bottled in a hurricane lamp to serve as Joan’s assistant; an eco-terrorist named Philo Dufrense travels in a pink-and-green submarine designed by Howard Hughes; a Volkswagen Beetle is possessed by the spirit of Abbie Hoffman; Meisterbrau, a mutant great white shark, is running loose in the sewers beneath Times Square; and a one-armed 181-year-old Civil War veteran joins Joan and Ayn in their quest for the truth. All of whom, and many more besides, are caught up in a vast conspiracy involving Walt Disney, J. Edgar Hoover, and a mob of homicidal robots. Set This House in Order: A Romance of Souls — (2003) Publisher: Andy Gage was born in 1965 and murdered not long after by his stepfather… It was no ordinary murder. Though the torture and abuse that killed him were real, Andy Gage’s death wasn’t. Only his soul actually died, and when it died, it broke in pieces. Then the pieces became souls in their own right, coinheritors of Andy Gage’s life… While Andy deals with the outside world, more than a hundred other souls share an imaginary house inside Andy’s head, struggling to maintain an orderly coexistence: Aaron, the father figure; Adam, the mischievous teenager; Jake, the frightened little boy; Aunt Sam, the artist; Seferis, the defender; and Gideon, who wants to get rid of Andy and the others and run things on his own. Andy’s new coworker, Penny Driver, is also a multiple personality, a fact that Penny is only partially aware of. When several of Penny’s other souls ask Andy for help, Andy reluctantly agrees, setting in motion a chain of events that threatens to destroy the stability of the house. Now Andy and Penny must work together to uncover a terrible secret that Andy has been keeping… from himself. The Mirage — (2012) Publisher: A mind-bending novel in which an alternate history of 9/11 and its aftermath uncovers startling truths about America and the Middle East. 11/9/2001: Christian fundamentalists hijack four jetliners. They fly two into the Tigris & Euphrates World Trade Towers in Baghdad, and a third into the Arab Defense Ministry in Riyadh. The fourth plane, believed to be bound for Mecca, is brought down by its passengers. The United Arab States declares a War on Terror. Arabian and Persian troops invade the Eastern Seaboard and establish a Green Zone in Washington, D.C… Summer, 2009: Arab Homeland Security agent Mustafa al Baghdadi interrogates a captured suicide bomber. The prisoner claims that the world they are living in is a mirage — in the real world, America is a superpower, and the Arab states are just a collection of “backward third-world countries.” A search of the bomber’s apartment turns up a copy of The New York Times, dated September 12, 2001, that appears to support his claim. Other captured terrorists have been telling the same story. The president wants answers, but Mustafa soon discovers he’s not the only interested party. The gangster Saddam Hussein is conducting his own investigation. And the head of the Senate Intelligence Committee — a war hero named Osama bin Laden — will stop at nothing to hide the truth. As Mustafa and his colleagues venture deeper into the unsettling world of terrorism, politics, and espionage, they are confronted with questions without any rational answers, and the terrifying possibility that their world is not what it seems. Acclaimed novelist Matt Ruff has created a shadow world that is eerily recognizable but, at the same time, almost unimaginable. Gripping, subversive, and unexpectedly moving, The Mirage probes our deepest convictions and most arresting fears. CLICK HERE FOR MORE TITLES BY MATT RUFF.